This is a review of a product called All Natural Advice Brightening Organic Crème. The manufacturer claims that this skin lightening cream is a safe and natural formula that moisturizes and tones skin as well as reduces discoloration. However, is this skin lightener the best solution for more radiant looking skin? This review will examine the product ingredients as well as various aspects of customer service to help you answer that question. The manufacturer provides an exceptionally long list of ingredients included in the product formula without stating which are the key active ingredients. While this is unfortunate, we have compiled a list of ingredients that may support the manufacturer’s claims. The ingredients listed above offer several benefits for the skin, such as Glycerin; which is known to nourish skin by retaining moisture and hydration. Aloe vera is a popular addition to skin care products for its ability to support the regeneration of skin cells and promote effective healing; while Jojoba oil prevents irritation and inflammation with its antibacterial properties. Vitamin E promotes the health of the skin by stimulating circulation; green tea rich in antioxidants that promote younger looking skin; and shea butter moisturizes skin. These Ingredients support skin health and thus may brighten and lighten skin. However, as the active skin lightening ingredients where not explicitly stated, we are unsure of this product’s ability to fulfill its claims of efficacy. The lack of patented ingredients, such as REGU-FADE (which reduces skin pigmentation) or Alpaflor Gigawhite ( which brightens skin while reducing the appearance of sunspots) makes us further question this product’s efficacy especially when competitor brands have up to 5 patented ingredients. Furthermore, this product was not manufactured in a GMP certified facility, which makes the quality of the production processes questionable. To use this product, apply a small amount of the cream to cleansed skin – massaging it in with a circular motion until it is absorbed. In saying so, this is adequate instruction information, however, the manufacturer does not state how many times an application is required for desired results. As there is no indication of the concentration of active ingredients (or what the active ingredients are exactly), we cannot be sure if this product will be effective or not. All Natural Advice Brightening Organic Crème can be purchased directly from the manufacturer’s website. A 4 oz. tub retails for $39.99, which seems affordable considering the size of the product. However, the lack of active ingredients is a concern. There are no discounts or package offers available, therefore, sustained use of this product may become costly. All Natural Advice offers a 90-day money-back guarantee for their products, however, there is no information pertaining to a returns policy. The lack of context to the extent of use f the product, for example, could result in customers being prevented from being granted their refund. This policy is therefore unreliable and makes us question the extent of the customer support offered by this company or the manufacturer’s confidence in the product’s effectiveness. Furthermore, there are very few customer reviews available online. Of the few we did find, there were complaints of experiencing severe allergic reactions to the product while others mentioned that the product did not work for them. This is a concern. 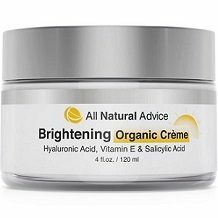 All Natural Advice Brightening Organic Crème appears to be a great product at first glance. The formula includes some ingredients that are beneficial to the skin and may fulfill some of the manufacturer’s claims. However, the lack of explicitly stated active ingredients, as well as no patented ingredients, is a concern and leaves the extent of efficacy in question. No GMP certification is also concerning as this brings the quality of the production process into question. While the price seems relatively affordable, the lack of discounts and bulk offers discourages sustained use. Although the guarantee appears to be extensive, the policy lacks supportive information to justify the extent of the customer service. These reasons, along with limited customer reviews, is why we do not recommend this product as the best choice of skin lightener available on the market.